Also known as combo workouts, fusion fitness and hybrid workouts, these classes, whether in a gym or on DVDs get the body working in ways it wouldn’t otherwise, by mixing moves and exercises from different types of workout, including martial arts, yoga and cardio type workouts. These can include such classes as aerial yoga, piloxing, cardioga, poolates and kayoga. If you think your current workout routine is not doing enough for you then you absolutely need to try a fusion class. It will add an extra dimension for you, more flexibility or strength or aerobic capacity. A spinner missing a strength component, for instance, could take a class using body weight or resistance bands and free weights to train a wider muscle group. You could pick a class with one of your favorite or current workouts in the name. If you are already doing yoga then try a yoga fusion class such as aerial yoga, piloxing (boxing with Pilates) or poolates. 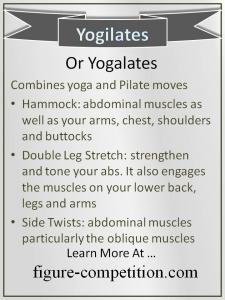 If you need extra flexibility or core strength, then you could try yogilates. Alternatively, you could try something totally wild and different for you, like one that includes a dance class or kettlebells. Dance Fusion Classes such as Zumba and Masala Bhangra are great for those who are looking for a fun way to burn calories. or improve fitness or you could try belly dancing, hip-hop, or jazz aerobics. If you prefer a home workout, you could try one of the extreme fitness type DVDs, which fuse cardio, pilates, plyometrics and isometric movements. You could of course also try a favorite stand-by – the stationary bike. If you use that alongside a favorite exercise DVD or a floor workout exercise, you will still be getting a mix of exercises. A 45-minute session can help you burn 600-900 calories an hour, depending on your fitness level and the amount of exertion. Staying fit is a lifestyle and if you are serious about going in for a figure or fitness competition or even just staying fit and healthy, you may want to consider seeking the help of a wellness coach or personal trainer. Fitness coaches will push you to greater heights than you might push yourself with exercise and training, they can also improve your form. A fitness coach who has previously competed will also be able to provide advice on diet and how to present yourself on stage. A wellness coach will provide guidance on long-term changes that you can make so you can enjoy a healthy lifestyle for good. The one-on-one approach is similar to that of personal trainers. The only difference is that a wellness coach looks at your lifestyle and habits holistically. They will then determine what strategies will help you achieve your fitness goals. Ask your doctor or personal trainer if they can recommend a wellness coach. Before meeting with a coach, make sure you are ready to commit to making positive changes in your life. Walking and swimming are both excellent forms of exercise that can be enjoyed by people at all levels of fitness. And you can enjoy fusion workouts even with these by joining a water aerobics class or using outside gym equipment available along some walks. Whatever your current level of health and fitness and whatever your goals for the future, enjoy your workout. You will get more from it and be more motivated to continue to reach your personal best.